"It is possible to make a Ship or Boate that may goe under the water unto the bottome, and so to come up again at your pleasure. [If] Any magnitude of body that is in the water . . . having alwaies but one weight, may be made bigger or lesser, then it Shall swimme when you would, and sinke when you list . . . ."
In other words, decrease the volume to make the boat heavier than the weight of the water it displaces, and it will sink. Make it lighter, by increasing the volume, and it will rise. 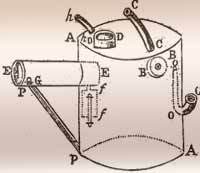 He wrote of watertight joints of leather, and a screw mechanism to wind the volume-changing "thing" in and out. Bourne was describing a principle, not a plan for a submarine, and offered no illustration. 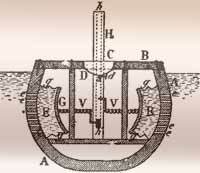 Dutchman CORNELIUS DREBBEL, hired in 1603 as "court inventor" for James I of England, built what seems to have been the first working submarine. According to accounts, some of which may have been written by people who actually saw the submarine, it was a decked-over rowboat, propelled by twelve oarsmen, which made a submerged journey down the Thames River at a depth of about fifteen feet. French priest MARIN MERSENNE theorized that a submarine should be made of copper, cylindrical in shape to better withstand pressure and with pointed ends both for streamlining and to permit reversing course without having to turn around. 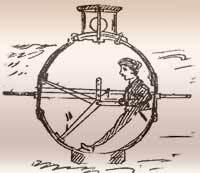 Our story starts in 1874, when an Irish emigrant John Holland submitted a submarine design to the Secretary of the Navy. Holland was to play a significant part in the English development of submarines, and by 1904, five British Hollands were assigned to defend Portsmouth – and managed to "torpedo" four warships. On a more sombre note: "A-1" – first of a brand-new British designed class of improved Hollands was run over by an unwitting passenger ship, and sank with the loss of all hands. "A-1" was salvaged and put back in service. This craft is now pride of place in the Submarine Museum. In 1900, Britain was the only major maritime power not to have at least an embryo submarine flotilla but, despite vehement condemnation of the submarine as a means of waging war, those determined to find out what all the fuss was about prevailed in the argument. 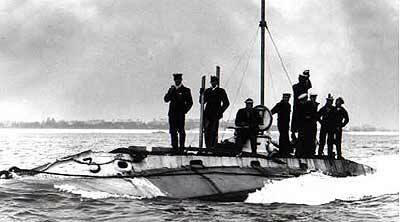 Holland I was launched in 1901 and the RN's Submarine Service was born.